Cháo (Congee/Porridge) Cháo, Congee or rice porridge this dish is served in a variety of Asian cultures, each preparing it their own specific way. Generally speaking the dish begins by boiling rice down into a solf gruel. Thickness and additional ingredients will vary according to culture and region. Served plain it's often eaten on the side of a main meal, however there are many ways to add ingredients and flavours, so much so that it can become a meal on its own. Phở (Vietnamese Noodle Soup) This now staple of Vietnamese cuisine is actually itself only about 100 years old- a baby compared to other cuisine mainstays. With it's name referring to the noodle itself, rather than the broth, this dish lanched itself onto the Western map a few years ago, becoming so popular it's hard not to meet a self proclaimed 'foodie' who doesn't know what this noodle soup is all about. Surprisingly perhaps, popular street food is actually most commonly eaten for breakfast in Vietnam, and consists of broth, thick rice noodles, meat (often either chicken or beef) and crunchy, fresh add ins such as bean sprouts, Thai basil, coriander or chillies, depending on what region it's made in. 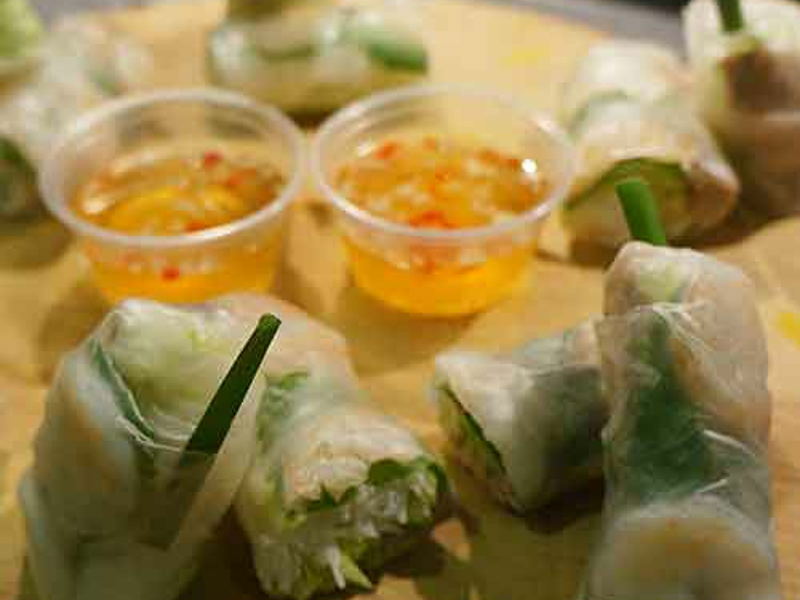 Vietnamese Summer Rolls or Gỏi cuốn These delicious raw rice paper rolls usually consist of pork or prawns, raw vegetables, rice vermacelli and sometimes mint or chilli. While these types of rolls are found through out Asian cuisine, these specific Vietnamese rolls are the only ones which still remain uncooked on the outside and served at room temperature, as opposed to being deep fried or steamed. Served along side a dipping sauce, these easy-to-make rolls make for a flavourful, easy and light dish, perfect for snacking or served as a starter when entertaining. Interested in learning more? If you're in London check out our Vietnamese classes, or if you're in Bath check out friend of School of Wok and wonderful teacher Noya's classes.